Looking for a safe place where you and your baby can learn and connect with other parents and babies? 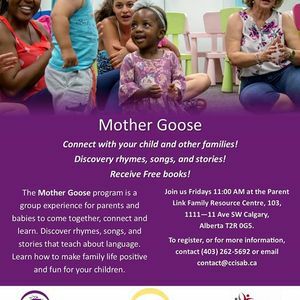 Then come and join the Further Education Society's Mother Goose program at the Calgary Catholic Immigration Society's Parent Link Family Resource Center! Fridays from 11 AM to 12:00 PM. Connect with other parents their children as you discover rhymes, songs, and stories that help with your child's development. Learn how to make family life positive and fun! This program is FREE, and participants will receive free children's books. To register, or for more information, contact the Parent Link Family Resource Center at 403-262-5692 or Y29udGFjdCB8IGNjaXNhYiAhIGNh.